If you ride the Muni Taraval line all the way to its end at San Francisco’s Ocean Beach, you might hear a lone wolf’s howl over the crashing surf. 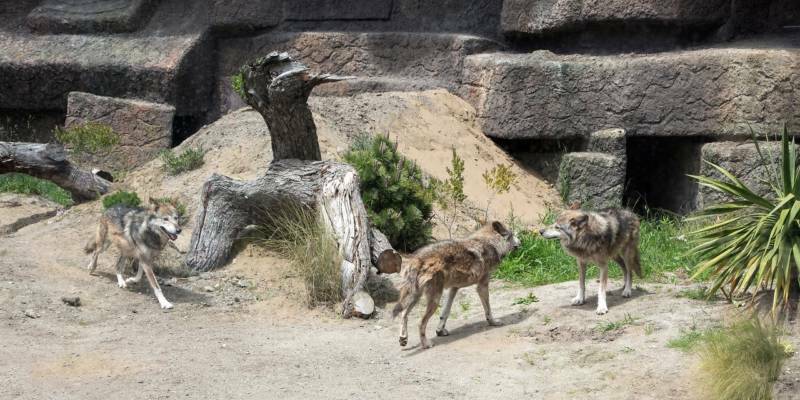 You wouldn't be tripping—it could be one of three Mexican wolves now living at the city’s zoo. 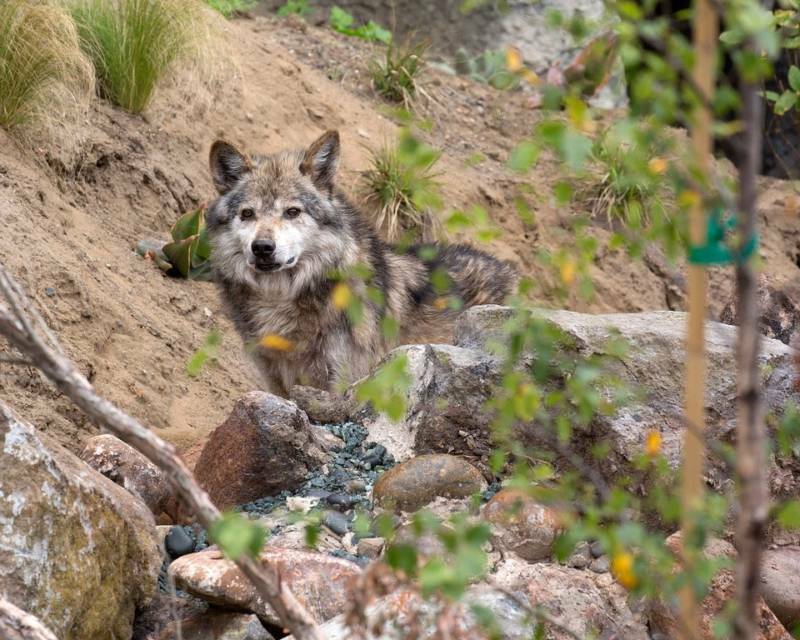 The trio is settling into new digs at "Wolf Canyon," which opened to the public today. And the wolves aren’t just for show—they’re key to the conservation of their wild brethren, as part the Mexican Wolf Species Survival Plan. The pack is part of a captive breeding program to contribute to the genetic diversity—and therefore the survival—of wolf populations that have been reintroduced to their historical ranges in the southwestern U.S. and central Mexico. “There’s a lot of talk about animal reintroduction into the wild, but it’s not as common as the layperson thinks,” says David Bocian, Vice President of Animal Care at the San Francisco Zoo. Genetic diversity is a major challenge to such programs, continues Bocian. The more narrow the gene pool, the more vulnerable the population. Mexican wolves are the smallest, southern-most subspecies of gray wolf in North America and were almost obliterated by the early 1970s. As the Wild West morphed into ranchland in the mid-1900s, the numbers of elk, deer and other prey plummeted, forcing the wolves to turn to domesticated livestock. The U.S. and Mexico retaliated with a campaign that nearly wiped out the entire species. When the Mexican wolf was listed as endangered in 1976, the two countries made a plan. “To get a hold of as many wolves in the wild as we can before they go extinct on us,” says Peter Siminski, director of conservation for The Living Desert and coordinator for the Mexican Wolf Species Survival Plan. 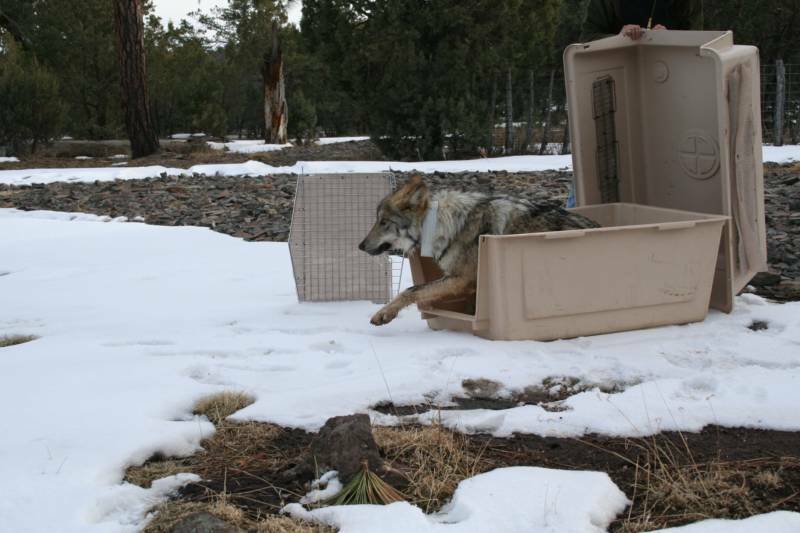 The recovery team frantically caught five individuals—the only wolves they could find—and began a captive breeding program to repopulate the dry mountain ranges of eastern Arizona, western New Mexico and central Mexico. In 1998, the first pack of 11 wolves ran into their designated habitat and began to establish territories for their families. Today, there are around 100 individuals in the wild and more than 240 in captive breeding facilities in the U.S. and Mexico. “All the wolves currently in the wild came from ancestors that were bred in captivity,” Siminski says. Genetic diversity gets lost over generations, especially in populations descended from so few individuals, says Bocian of the SF Zoo. “We’re never going to increase it unless we stumble upon some wild animals, and that’s not likely,” he says. Instead, the Association of Zoos and Aquariums (AZA) and the U.S. 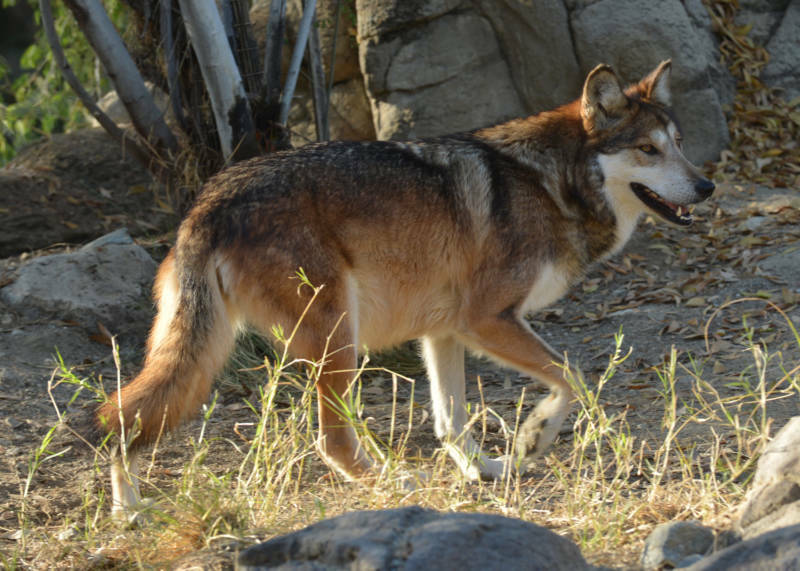 Fish and Wildlife Service (USFWS) partner with Mexico in the Mexican Wolf Species Protection Plan to track captive wolves carefully to prevent relatives from mating with each other. The partners may move male and females around to different zoos to breed. And the three new studs at the SF Zoo will contribute to the gene pool in yet another way. This winter, scientists from the St. Louis Zoo will fly out to San Francisco to collect sperm from wolves here to bring back to the Mexican wolf gamete bank—a kind of emergency diversity fund. The gene bank also holds eggs from female wolves. The conservation story of the Mexican wolves is similar to the story of the California condor. Condor handlers wore costumes so the birds would stay wary of humans, and would have a better chance of surviving in the wild. The SF Zoo has a similar goal for the wolves, but is taking a more “Silicon Valley” approach. Watters collaborated with Silicon Valley-based Crowd Optic to rig the wolf exhibit with gadgets to minimize the amount of interaction the animals have with zookeepers. By “turning on” the enclosure with various forms of technology such as automatic feeders, the exhibit itself—rather than the human handlers—will manage the wolves behavior, Watters says. Visitors get to observe the wolves, but limiting direct human contact helps retain the animals’ wild nature, making the habitat appropriate for wolves who could be released back into the wild. 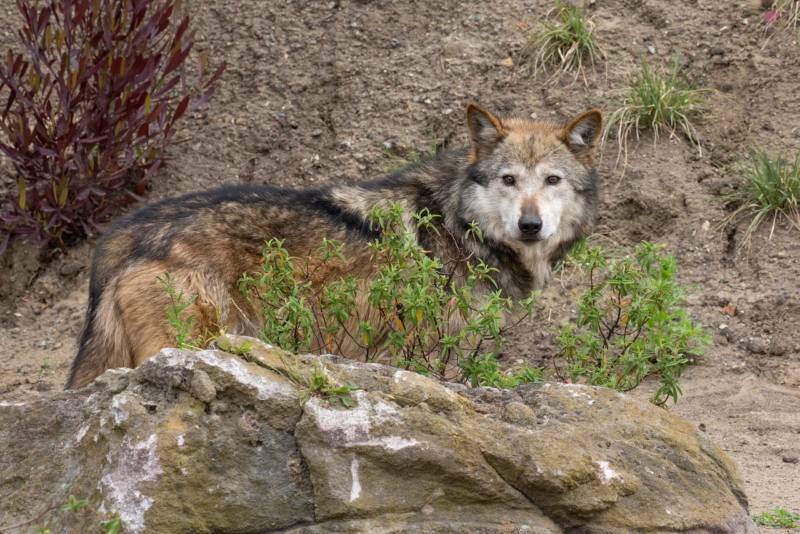 The zoo's three new wolves are probably too old to be released. At age 10, they are practically geriatric. Thanks to the gamete bank, though, the wolves could father pups for decades to come.